[CIVIL WAR]. 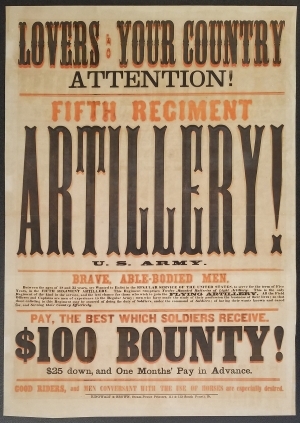 Artillery Recruitment Broadside, Fifth Regiment, U.S. Army, ca. 1861. 1 p., 22½ x 31 in. Pay, the Best Which Soldiers Receive. $25 down, and One Month’s Pay in Advance. Good riders, and Men Conversant with the Use of Horses are especially desired. On May 3, 1861, President Abraham Lincoln added a fifth regiment of artillery to the Regular Army of the United States. The Fifth United States Artillery consisted of twelve batteries. Congress confirmed President Lincoln’s action on July 12. Unlike older artillery regiments, this one was comprised of only field batteries. Each battery was armed with 12-pounder Napoleons, 10-pounder Parrott rifles, and 3-inch ordnance rifles. Each gun required two six-horse teams to transport it. One battery even participated in the First Battle of Bull Run on July 21. Over the course of the war as part of the Army of the Potomac and later of the Army of the James, the 5th U.S. Artillery participated in 108 battles, sieges, and engagements. Batteries from the 5th participated in every major battle in the East from the First Battle of Bull Run, through Antietam, Fredericksburg, Chancellorsville, Gettysburg, the Wilderness, Cold Harbor, the siege of Petersburg, and the Confederate surrender at Appomattox Court House. Nearly four thousand soldiers served in the 5th U.S. Artillery during the Civil War, of whom 240 were killed in battle or died of wounds or disease. John Luther Ringwalt (1828-1891) and J. G. L. Brown (1825-1878) were Philadelphia businessmen. In 1858, they partnered to establish the printing firm of Ringwalt and Brown under the supervision of Stephen Greene (1831-1908). Ringwalt was born in Lancaster, Pennsylvania, of German ancestry. He early became a newspaper editor and later moved to Philadelphia, where he helped to edit The Philadelphia Press. In 1875, Ringwalt became editor of Railway World, which he edited for fifteen years. J. G. L. Brown was also born in Lancaster, Pennsylvania, and became the business manager of The Philadelphia Press. In 1871, the governor appointed Brown as coroner of Philadelphia, and he retired from the Press. Just before his death, he became one of the owners and publishers of Godey’s Lady’s Book.